There’s an old saying that states “it’s better to be lucky than good.” The reciprocal of that notion might be “if you’re good, really good, you’re already lucky” Good/Lucky, Lucky/Good? Either way, it beats the alternative! With regards to the final four players at the 2018 W&S Open, good was a given… lucky became a byproduct…and winning provided the ultimate separation from your peers. 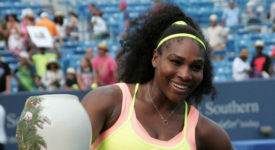 After the skies cleared, and the rain clouds moved eastward, the final outcome of the W&S Open was left up to four dynamic players…. each with their own motivation….each with their own story. If you would have taken a poll prior to the W&S Open women’s finals, it’s likely the name Kiki Bertens would not have been mentioned as a potential finalist. Despite the fact that Bertens was ranked a respectable #17 on the WTA circuit she was virtually an unknown commodity coming into the tournament. Certainly not as a finalist…and definitely not as a viable competitor versus world #1 Simona Halep. But therein lies the beauty of tennis and individual competition. At the end of the day, the only opinion that really mattered was Bertens. As the searing heat blanketed center court for the start of the women’s final Bertens was prepared to take full advantage of the opportunity before her. In what can only be classified as a tremendous upset, Bertens went on to oust the favored Halep in three sets 2-6, 7-6, 6-2—capturing her first W&S Open championship. When it comes to WTA rankings Simona Halep is literally “second to none”– given she has held the WTA #1 ranking since October 2017.But for Halep, this year’s W&S Open meant more to her than just a token appearance, or an opportunity to solidify her ranking. This year marked Halep’s third appearance in the finals…without a victory. And it was a safe bet she wanted to ensure her fate would not end-up like previous finals. Victory was the option- the only option. Unfortunately for the skillful top-seed (Halep) someone forgot to inform Kiki Bertens of the predetermined script coming in. Bertens would go on to write her own storybook ending, leaving Halep to once again ponder what might have been. Just a few short years ago the brilliance and dominance of Novak Djokovic was on full display throughout the tennis world. His competitive nature, and that welcomed bravado, became a staple of modern tennis — embraced by many, rejected by few. A former #1 player in the world, with13 grand slam titles, Djokovic’s rise to the top placed him on equal status with such peers as Roger Federer, Rafael Nadal, and Andy Murray, to name a few. But with the status of being #1 comes the challenge of remaining #1–and within that challenge is the unpredictable liability of injuries—-which played an unfortunate part in Djokovic’s slide from #1 to somewhat obscurity during the year 2017. But as with most true champions, comebacks can provide just the motivation required to climb back up the mountain of success. Djokovic’s return to the grand stage began just a month ago with yet another victory at Wimbledon—(his fourth)—and a clear indicator that he was prepared to return to his once dominant reign. At this year’s W&S Open men’s final Djokovic continued to build upon his comeback with a convincing straight set defeat of the once invincible Roger Federer….6-4, 6-4. The win was surprisingly Djokovic’s first W&S Open title in five tries. Very few in the world of tennis can, or will, dispute the greatness that is Roger Ferderer. 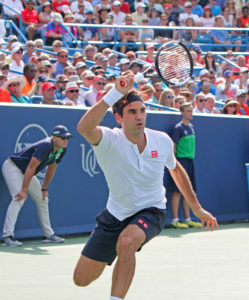 For close to two decades, Federer has been perhaps the most consistent and dominant player in men’s tennis– with a record 20 grand slam titles to his credit. And even today, at age 37, he remains oblivious to the footsteps of Father Time. Quite simply, when it comes to Federer, Father Time has yet to catch-up. Add to Federer’s tennis acumen…his cool, calm, and collected demeanor (on court and off) and it’s no wonder that fans, and players alike, often few him as the standard bearer for achievement in tennis history. While Father Time remains in a slow jog towards Federer, it was left up to a reenergized Novak Djokovic to find a slight break in Federer’s stride—defeating him in straight sets. Lucky/Good, Good/Lucky? The only true measure of success seems not to face the alternative. For the final four players at this year’s W&S Open the alternative was never a consideration!